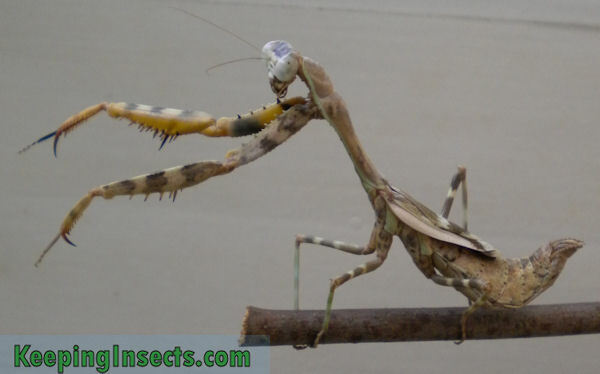 The budwing mantis, or more specifically Parasphendale affinis, is a popular species of praying mantis to keep as a pet. Of the Parasphendale genus, two species are being kept in captivity: Parasphendale affinis and Parasphendale argrionina. This caresheet deals with both of them. The difference between the species is hard to see and their needs are the same. In nature, Parapshendale sp. occurs in East Africa (Ethiopia, Kenya, Somalia and Tanzania). 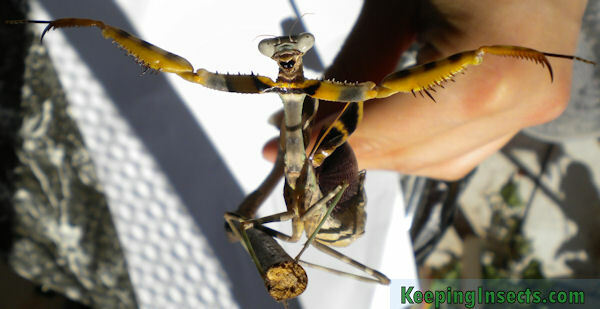 Many people in Europe, Japan and the US keep this mantis species as a pet. 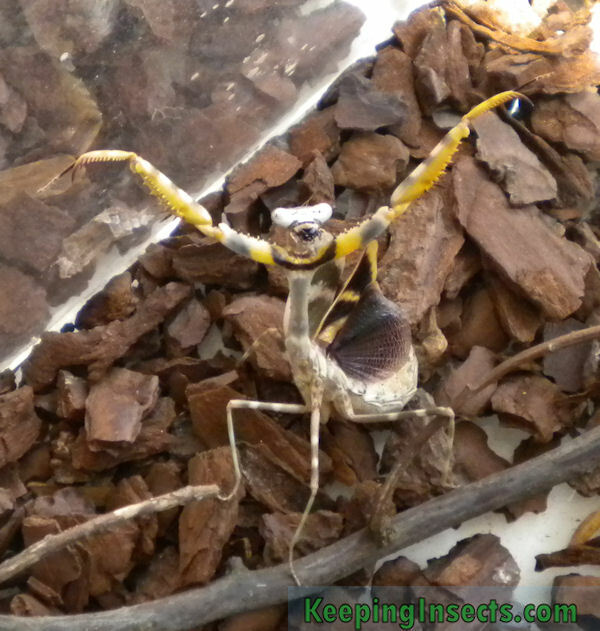 An adult female of the Budwing Mantis in threatening pose (deimatic display) – Parasphendale sp. This species of praying mantis is usually light to medium brown, but there are also very dark and beige variations. They have a lot of dark and light spots on the body and legs. The females of this species are about 7 cm long, the males reach a size of just 4 cm. The adult females have wings, but they are rather short and cannot be used to fly. They reach to half of the abdomen. The wings are used in a deimatic display, in which the mantis will put its wings up and show the brightly colored underside of the wings. The underside of the wings is bright yellow-orange, and the inside of the front legs is also orange and but outwards to show to the predator that is threatening the mantis. This display is meant to scare away predators. The under wings of this species are black with white-pink veins. The males have wings that reach to the end of their abdomen. They use their wings to fly and will not show the deimatic display. Parasphendale mantis species are a very aggressive kind of praying mantis. Its female is especially known for its voracity. She actively chases after her prey once she is aware of it. 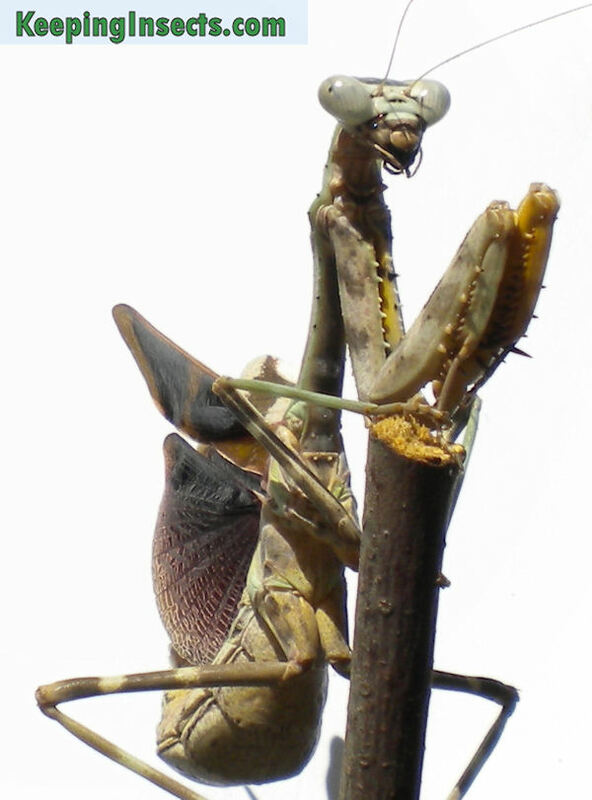 If your irritate or grab this mantis, the animals show a dramatic threatening posture. Then it spreads its fore arms to the side so bright colors become visible and it will spread its wings so scared eyes to see. Males of this species are easily scared and when adult will fly away from things that they perceive as threatening. An adult female of the Budwing Mantis – Parasphendale sp. The ideal temperature for the Budwing mantis is about 26 ° C, but between 24 and 30 ° C it feels good too. At night you can let the temperature drop to around 18 ° C.
This species does not have high demands regarding the air humidity, but it is important to spray about two or three times a week to allow it to drink. A target air humidity is about 50% in a place with lots of ventilation. 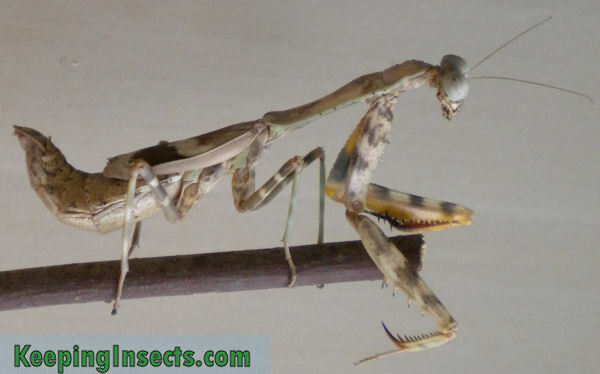 As with all types of praying mantids, this species needs a cage of at least 3 times the length of the animal in height, and at least 2x the length of the animal in width. For an adult female this means at least 21 cm in height and 14 cm in width. A nice size for a terrarium would be 30 x 20 x 30 cm (hxwxd), so there is room for lots of fake plants and perches. Bigger is always better. Because Parasphendale sp. 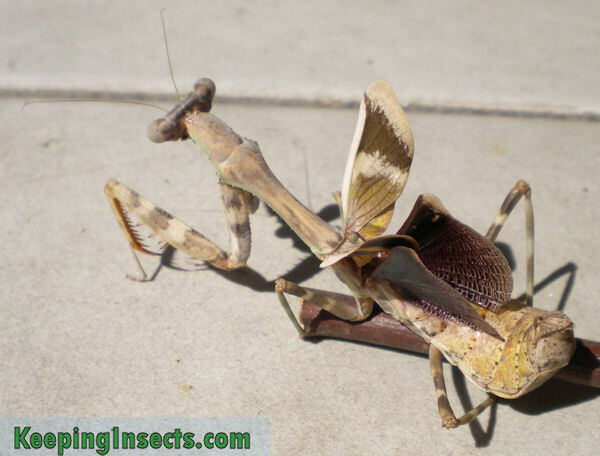 mantids are such active predators, you cannot keep them together in the same enclosure. Sooner or later one will eat the other. Young nymphs can be kept together until L4 (fourth instar). An adult male of the Budwing Mantis – Parasphendale sp. 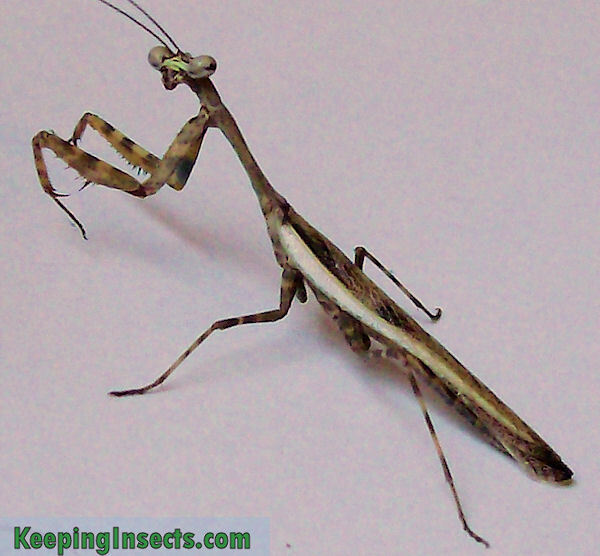 The budwing mantis can be bred pretty easily if taken proper care of them. First you need to get an adult pair of a male and female mantis. Luckily it’s easy to see the difference with the Budwing Mantis. The females of this species are larger and wider than the males, this can already be seen when they are still a nymph. You can also use the Segment Counting Sexing Method. If this species reaches maturity, it can be seen in a glance which one is the male and which one is the female. Females are really big with short wings, while males are small and slender and have long wings. Approximately 2 to 4 weeks after the last molt, you can introduce the male to the female. Make sure that the female eats very well before you put the male in her enclosure. The female can be quite aggressive to the male and could eat him before the mating. When the female is responding agressively to the male, it is better to remove him and try again an other time. Mating can take several hours, the male must subsequently be removed from the residence (to safe its life). Deimatic display of an adult female of the Budwing Mantis – Parasphendale sp. Deimatic display seen from the back side of the mantis – Parasphendale sp.